Dell teamed up with Sony Pictures, a long time Dell customer and partner, to take collaborations to the next level with Spider-Man: Homecoming. Collaborating both behind and in front of the camera, Spider-Man: Homecoming will kick off a 360-degree integrated global marketing campaign featuring the highly anticipated film and PC gaming industry’s newest entrant, Dell’s new Inspiron 15 7000 Gaming laptop. The alliance will integrate Dell products into the film’s storyline along with a full-scale marketing and promotional campaign featuring Dell and Sony Pictures Spider-Man: Homecoming properties. The campaign features a TV spot, cinema, print, digital advertising, out-of-home placements, and consumer engagement activations throughout the summer. The campaign will engage fans of Spider-Man and the Marvel Cinematic Universe; as well as movie fans at large who like to game for fun and socialize, and more competitive gamers looking for the latest in technology and the best visual gaming experiences. The television ad campaign highlighting new Spider-Man content created with Jon Watts, the director of Spider-Man: Homecoming, features Peter Parker daydreaming in class about an epic battle between Spider-Man and the Vulture. The advertising spot will air on TV networks in the US on June 26 and later this summer in China, UK, Brazil, Japan, Australia and Mexico across cinema, online and TV. Sony Pictures’ Academy Award®-winning visual effects studio, Sony Pictures Imageworks, leveraged Dell Precision technology to create world class visual effects for Spider-Man: Homecoming, using approximately 1000 Dell Precision workstations, more than 4,000 Dell servers, and over a petabyte of Dell/EMC storage. “The computing power of Dell Precision workstations, coupled with thousands of PowerEdge servers, enables rapid creative iterations and allows us to put the best picture on screen,” said Erik Strauss, executive director, Software Development at Sony Pictures Imageworks. Dell also collaborated with Sony Pictures Virtual Reality on Spider-Man: Homecoming VR, a new multi-platform promotional VR experience based on the upcoming film, which was created on industry-leading Dell Precision workstations. Produced by Sony Pictures Virtual Reality and developed by CreateVR, Spider-Man: Homecoming VR offers players the chance to suit up as Spider-Man, hone their web-shooting skills and sling high above New York City in pursuit of the Vulture. The VR experience will be available for free across all major VR platforms starting June 30, leading up to the July 7 theatrical release of Spider-Man: Homecoming. Fans can get a sneak preview of the VR experience at select Cinemark theaters in the U.S., where Dell’s PC line of VR-ready products for consumers – a top choice for VR fanatics and VR newbies alike – will be used in demonstrations. The Dell team worked closely with the Spider-Man: Homecoming filmmakers to integrate both Dell’s Inspiron 15 Gaming laptop (the lead product from Dell’s new gaming line) and Dell’s popular XPS 13 2-in-1 into the storyline of the film. 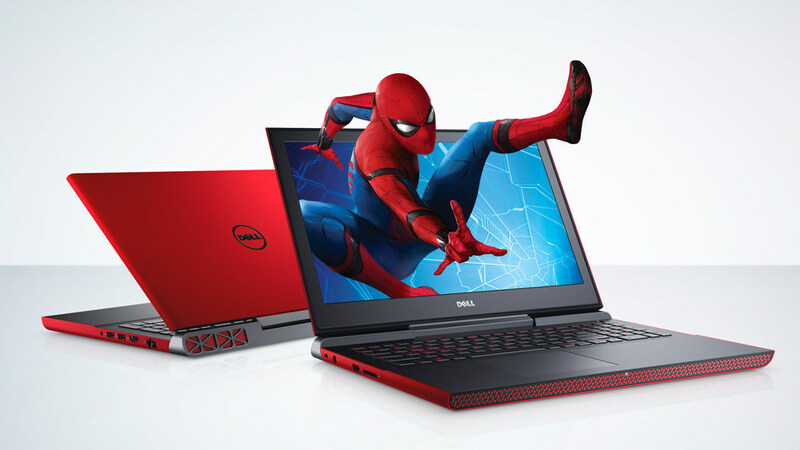 The Inspiron 15 Gaming laptop will appear in a pivotal scene as Peter Parker’s best friend, Ned, an avid gamer, connects his laptop to a Spider-Man suit chock-full of new technology, courtesy of Tony Stark. Stark’s friend and confidant, Happy Hogan, also uses the award-winning Dell XPS 13 2-in-1. Timed with opening weekend of Spider-Man: Homecoming, Dell and Sony Pictures will also invite fans to step into Spidey’s shoes. Passersby will be able to race to the top of a New York City skyscraper using their mobile phones in Times Square by participating in an immersive, interactive Spider-Man Scramble experience on some of the largest digital billboards in New York City. The video game will be live on Clear Channel Outdoor’s digital billboard on Broadway between 46th and 47th Street from June 30 – July 1 and July 7 – 8 from 2 – 10 p.m. EDT in Times Square allowing fans the opportunity to swing by Duffy Square and show off their Spidey skills. Against a backdrop of the real-life buildings in Times Square, players will control Spider-Man via their mobile phones as he races up two massive digital screens in front of the Times Square audience. The Spider-Man Scramble game was created on and will be projected on the Times Square billboards by Dell Precision mobile workstations. Finally, Dell will be a sponsor of the Spider-Man: Homecoming World Premiere June 28 in Los Angeles – helping to present a red carpet premiere that will truly be powered by Dell. Dell will bring a mobile experience directly to the red carpet for celebrities and VIPs to enjoy VR, gaming and other Dell tech demos along with behind the scenes Spider-Man: Homecoming content. A young Peter Parker/Spider-Man (Tom Holland), who made his sensational debut in Captain America: Civil War, begins to navigate his newfound identity as the web-slinging super hero in Spider-Man: Homecoming. Thrilled by his experience with the Avengers, Peter returns home, where he lives with his Aunt May (Marisa Tomei), under the watchful eye of his new mentor Tony Stark (Robert Downey Jr.). Peter tries to fall back into his normal daily routine – distracted by thoughts of proving himself to be more than just your friendly neighborhood Spider-Man – but when the Vulture (Michael Keaton) emerges as a new villain, everything that Peter holds most important will be threatened. Directed by Jon Watts. Produced by Kevin Feige and Amy Pascal. Screenplay by Jonathan Goldstein & John Francis Daley and Jon Watts & Christopher Ford and Chris McKenna & Erik Sommers, Screen Story by Jonathan Goldstein & John Francis Daley, Based on the Marvel Comic Book by Stan Lee and Steve Ditko. With award-winning desktops, laptops, gaming systems, 2-in-1s and thin clients, powerful workstations and rugged devices made for specialized environments, monitors, endpoint security solutions and services, Dell gives today’s workforce what they need to securely connect, produce, and collaborate from anywhere at any time. Dell, a part of Dell Inc., services customers from consumers to organizations of all sizes with the industry’s broadest, most innovative end-user portfolio.